BEAVERCREEK & XENIA — Kala Benton, RN, is the new Director of Patient & Family Experience at Greene Memorial Hospital and Soin Medical Center and the call to care for patients can be found in her pocket. Benton was just 17 when her grandmother Helen was very ill and she stayed by her side during that illness. As the director of patient experience in the Kettering Health Network hospitals, Benton believes her new role allows her to further ensure care for every patient. Her responsibilities include informing and guiding staff, listening to patients and families, and implementing suggestions and processes that make for a better experience. “A large portion of my job is to examine every stage of the patient experience, ensuring our treatment is the very best. But we don’t just measure the patients care, we measure the families care. We measure the overall experience from the moment a patient enters the hospital to the moment they leave — all personal contact with the patient,” said Benton. 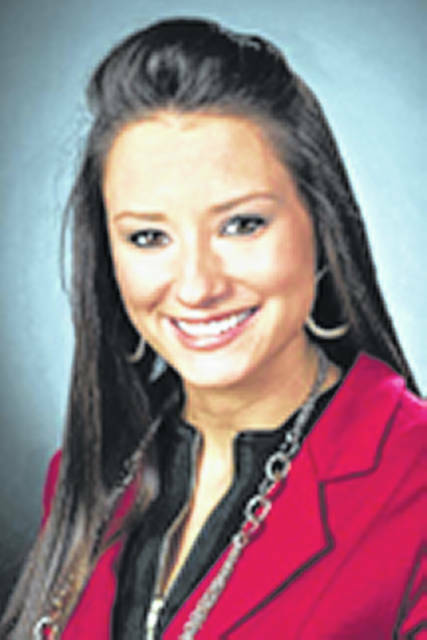 The Xenia native also wanted a career that would bring her back to her home in Greene County. If Benton seems familiar, it’s probably because she is also the Greene County Agricultural Society Director and a member of the Greene County Fair Senior Board Entertainment and Advertising Committee for the Greene County Fair. Benton graduated from Xenia High School in 2006 and received a bachelor of science degree in nursing from Harding University in Arkansas. She then completed her master’s degree in nursing administration at Wright State University. She came to Soin in 2012 where she transitioned from the ICU to patient experience and now is the director of that department. She also enjoys volunteering at festivals and in community outreach programs. Kala and husband Seth have been together for three years and live in Xenia. When they aren’t at home or working they both can be seen at the Greene County Fairgrounds.